For people who already know how to make paper: a booklet about making paper from milkweed plants, using different parts of the plant. The deluxe edition includes a tipped-in sample of milkweed paper (all samples vary, can be made from the bast or seed fiber of the plant). Prices include S&H. Regular edition: 15 USD; deluxe edition: 20 USD. Email contact [at] aimeelee.net for purchase, or send funds via PayPal to same email with your shipping address. Published by The Legacy Press. For libraries, schools, book-arts and conservation programs, non-profit organizations, retailers, and wholesalers, click here. Order from The Legacy Press—Amazon charges more! Honored by the Eric Hoffer Book Award in 2013. 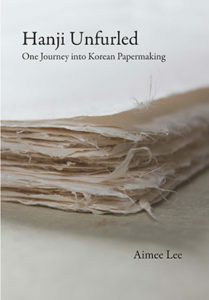 Korea: Available at Seoul Selection online and at Hank’s Book Cafe.